Our Homespun Shade Light features the chisel pattern, which is the signature design of our pioneer past. 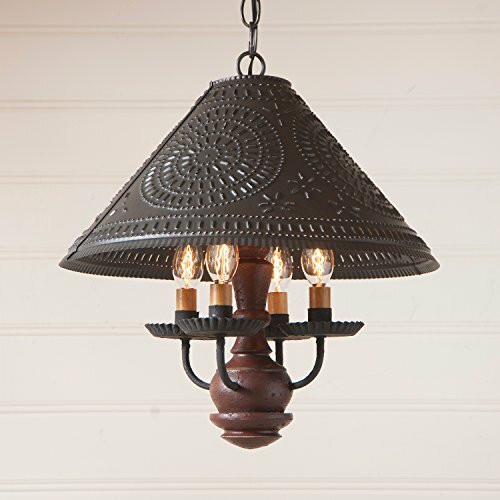 Crafted in our Kettle Black with a Plantation Red body, this versatile lighting accessory can brighten your breakfast nook, country kitchen or foyer. Direct wired with 4 candelabra sockets, 60 watts max. per arm. 7 feet of wire, 3 feet of chain, and a matching ceiling plate included. Additional chain may be ordered. Kettle Black shade with black textured arms with crimped pans. Body color is Textured Plantation Red that is slightly distressed. Handcrafted in Pennsylvania. This fixture is UL listed.